Stunning statement light. 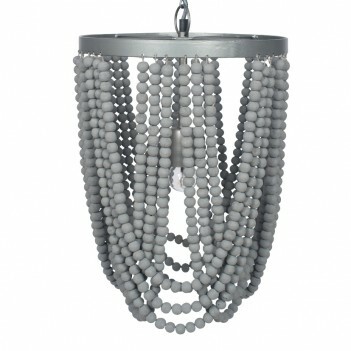 This grey, wooden beaded, metal pendant light is reminiscent of a traditional pendant but with a modern twist. Width 30cm x Depth 30cm x Height 43cm (excluding drop). Drop 135cm max, 57cm minimum. One 60W ES GLS bulb recommended. Please select the £6.99 delivery option if you wish this to be sent to you.